Being able to rock your hair any way you want to is not a reality for all of us. While many jobs focus less on what’s going on with your hair, others find a certain appearance necessary to maintain professionalism. Whether you agree or disagree with how a person chooses to wear their hair at work, sometimes it just makes it easier to find styles that allow you to look your best in the workplace without compromising your personal style and the health of your hair. No one here believes straight hair is more professional and we certainly do not buy into the idea that you have to cover your hair with a wig to be suitable for the workplace. If you are looking for something new that won’t compromise your personal style, your job, or the health of your hair, here are some tutorials to check out. MissT1806 has lovely hair and knows how to rock it professionally and playfully. She’s sharing 4 amazingly simple styles that are perfect for work and only require minimal time and effort. The first look is all about tucking, rolling, and pinning. If you can do all of those then you can rock this style. Hair must be longer than a TWA, and even if you cannot create a bun or puff at the end, this can altered by simply tucking and pinning all the way around. That first look is great for stretched hair that needs more longevity, as you may not be ready for wash day. The second style is a toned down version of the beloved frohawk. If you can twist and pin then you can create this style and give less hawk and more banded beauty. We love the pompadour and we love the bun, so when you put them together you get a work elegant style sure to protect. Even if you are not working with medium or longer lengths, add the aid of a ponytail or a donut to give the illusion of a bun in the back and you have a working style for days. The traditional bun is always work ready and MissT1806 shares her version, which is parted down the middle (halfway) with slicked edges and a big low bun straight to the back. This look can be altered for a side bud or even a high bun and still be work-friendly worthy. 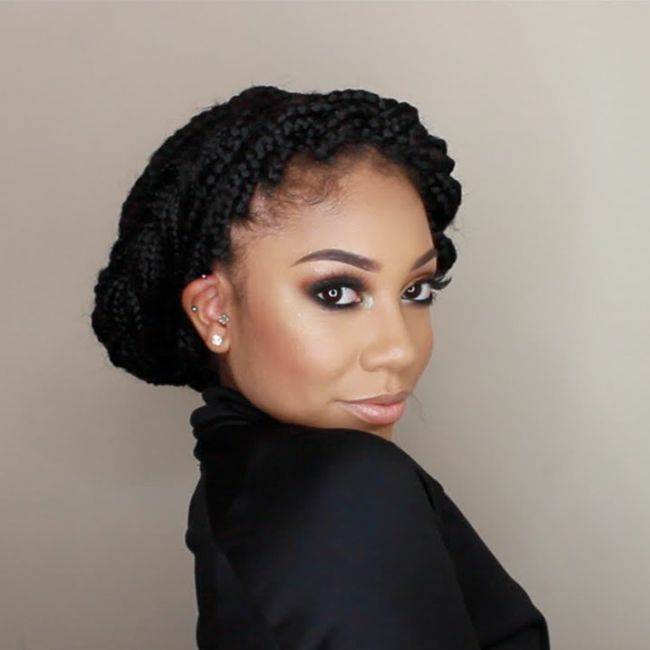 If you are rocking braids as a protective style this summer and worried about them being “work-friendly,” worry no more as we share a video on how to enjoy your braids and still look professional. The key is hair being out of your face for braids to give off the professional look. Faceovermatter shares 12 gorgeous styles to fabulously rock your box braids or even twists for that matter. She has them long, which afford her the ability to create several looks. From high buns to twisted braided headband, she comes up with several styles perfect for the boardroom to the classroom. I cannot forget my TWA or short-haired lovelies. I actually have two videos for you. Now, with shorter hair you always have the option of just rocking it naturally or placing a modest headband. If you want to jazz it up but still keep it professional I’ve got some options for you. The first one is by Jaelah O’Neil, and it is a popular one because it is cute, professional, and perfect for any occasion. It is a puff on short hair and if you thought you could not create one, then check her out because she has a beautiful puff that even the shortest of short hair can rock. This style is for curlies with a longer hair than TWA and who can flat twist to create a beautiful and elegant halo braid perfect for protecting your ends. No matter what style you choose to rock to work, know that curly, coily and wavy hair will always be professional as much as it is beautiful.